Golden beaches, sleepy villages and leafy forests await you on this 4-hour scooter tour of Mallorca. 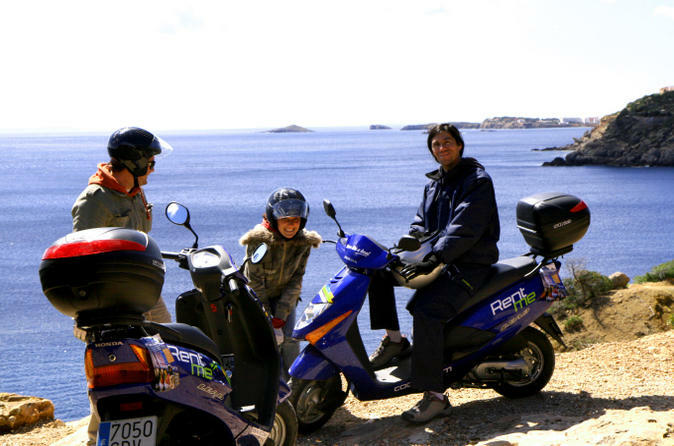 Choose from a morning or afternoon tour, and then set off either on your own scooter or with a partner to explore the sun-kissed Balearic island. Cruise through Magaluf and Portals Vells; seek out El Mago, a beach hidden among the pines; and feel the sea breeze against your face as you zip along the Mediterranean coast. Greet your guide at a pre-arranged location, greet your guide and listen to a safety briefing before climbing onto your scooter. When you’re ready, you’ll follow your guide along the picturesque curve of Mallorca’s southwest coast: admire a combination of gorgeous natural scenery, and landmarks such as Palma La Seu Cathedral and Almudaina Palace, as you drive through Palma de Mallorca city. Feast your eyes on both the Mediterranean Sea and lush forests as you travel towards Magaluf, a lively coastal resort famed for its magnificent beaches. Continue to El Mago Beach and spend some relaxed free time enjoying the secluded, white-sand spot. Throughout your tour, you’ll listen to commentary and discover hidden gems far from Mallorca’s tourist trail. Return back to your original departure point and bid your guide farewell at the end of the tour.